Chad Eckert, CEP, MES, CPT: He has an extensive background in the health & fitness industry as both a health club director and personal trainer. 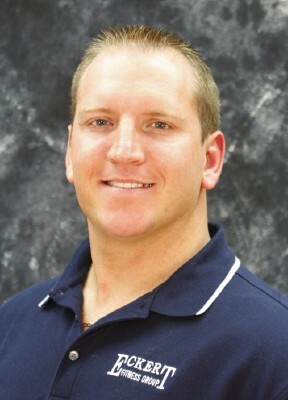 He has over 15 years experience at developing and implementing exercise programs for clients of all ages and abilities and is certified as an Exercise Physiologist through American College of Sports Medicine (ACSM). He is also certified as a Medical Exercise Specialist and a Personal Trainer through American Council on Exercise (ACE) and formerly held certification through National Strength & Conditioning Association (NSCA). He completed advanced training in weight loss, older adult fitness, athlete speed & agility, and in working with individuals with chronic diseases and disabilities. He previously served as Chapter Director and workshop clinician for the National Youth Sports Coaches Association. Chad has previously competed in bodybuilding competitions and currently competes in professional armwrestling competitions. He also owns MYOFIT, a performance activewear clothing brand. you may become part of our team.